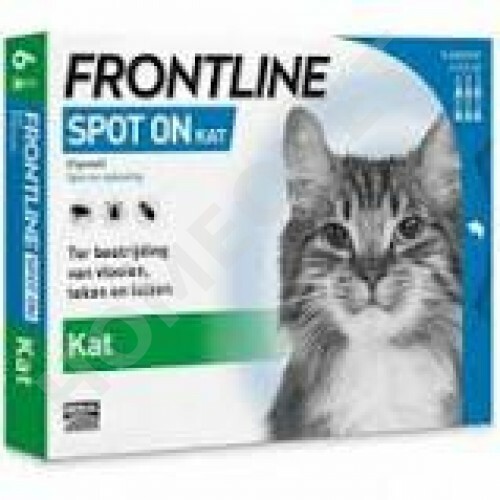 Frontline Spot On for Cats is used in the treatment and prevention of infestations by fleas, ticks in cats, and as part of a treatment strategy for Flea Allergy Dermatitis in cats. The product controls infestations with Felicola subrostratus biting lice on cats. Frontline Spot On Flea Drops for Cats and Kittens kills 98-100% of fleas within 24 hours for up to 5 weeks, whilst preventing reinfestation by adult and immature ticks for up to one month and also fully controlling infestations of lice within 48 hours. Elimination of fleas (Ctenocephalides spp.) and insecticidal efficacy against new infestations with adult fleas persists up to 5 weeks. Elimination of ticks (Ixodes ricinus, Dermacentor variabilis, Rhipicephalus sanguineus). The product has a persistent acaricidal efficacy for up to 4 weeks against ticks (based on experimental data). Frontline for Cats can be used in kittens from 8 weeks of age and weighing at least 1kg. Suitable for use on pregnant queens. Please refer to the dosage and usage instructions provided with the product before administering. If you are unsure on the usage of this product, please consult our Veterinarians who will be more than happy to advise you on its administration. 3 x 0.5ml Pipettes containing 50mg of the active ingredient Fipronil. Or; 6 x 0.5ml Pipettes containing 50mg of the active ingredient Fipronil. Animals or operators with a known hypersensitivity to insecticides or alcohol should avoid contact with Frontline for Cats. Avoid contents coming into contact with the fingers. If this occurs, wash hands with soap and water. After accidental ocular exposure the eye should be rinsed carefully with plain water. Safety precautions may be necessary during administration, please consult the packaging and/or product literature.